This weeks post is driven by a glut of pictures and the need to clear the air with a small confession. Yellow Bitterns (Ixobrychus sinensis) showed strongly during a recent trip to Singapore and on occasion it would have been impossible to pose them any better than they were already doing themselves. It is possible however that I may have done them a disservice by telling all and sundry that they were Cinnamon Bitterns, so I would like to set that error straight here. 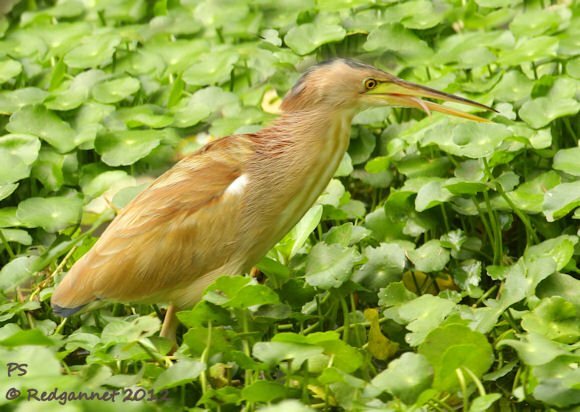 The Yellow Bittern is a tiny heron, substantially smaller than the Butoroides (Green and Striated) species and slimmer too. 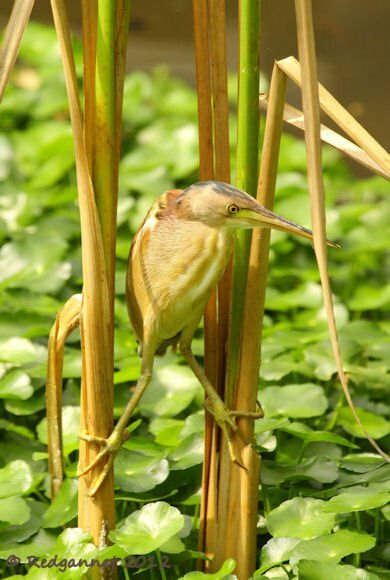 It is an adherent to fresh water lakes, canals and swamps from India through East Asia, Indonesia and New Guinea. The photos in this post are of three individuals. Light streaking on the underparts suggest that they are all females. 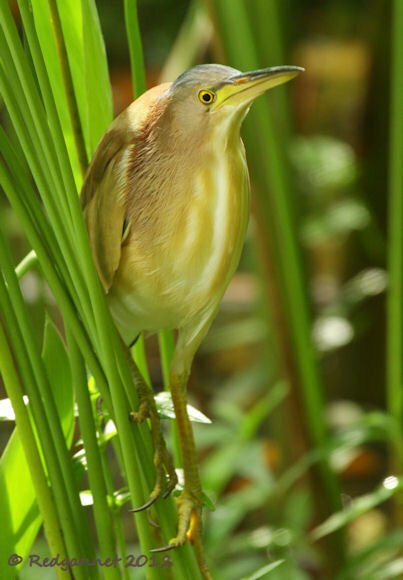 It likes plenty of cover as one would imagine of a bittern species and especially favours Pandanus. 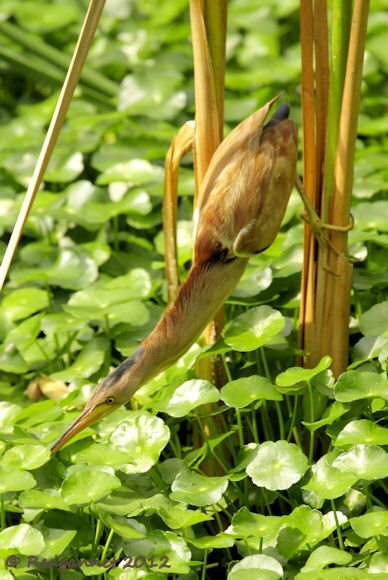 The classic bittern habit of freezing when alarmed with its bill raised can be seen in this species, though it allows very close approach or flushes if you get too close without seeing it. When it flies the dark primaries and tail contrast strongly with the dull yellow back, supposedly making it unmistakeable. 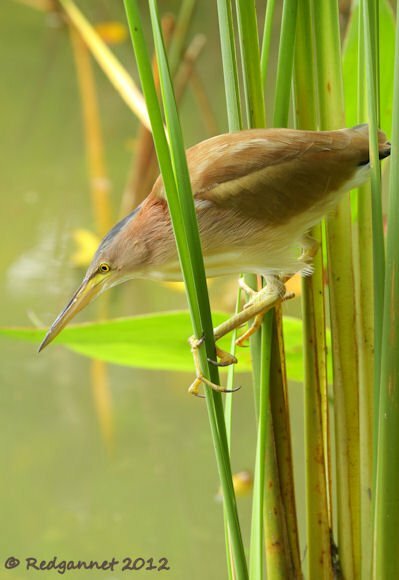 My mistake was corrected by a couple in Singapore’s Botanical Gardens, but not before I had pointed it out to a couple of birdy tourists there. 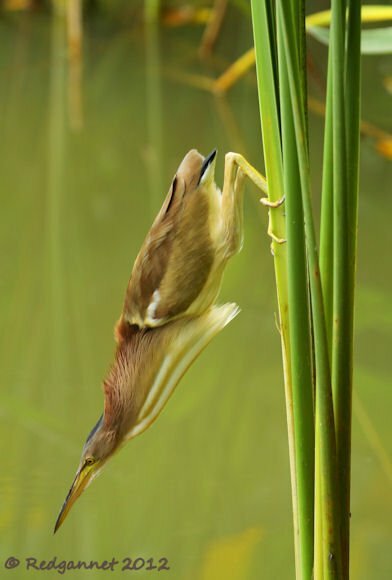 On each occasion the bird clambered into position and held itself between two reed stems above the water. To the uninitiated eye, it appears that it is too high above the water and it would not be possible to strike at a fish from that distance, but when it spots a target, it can invert itself and hold this position until it is ready to strike. 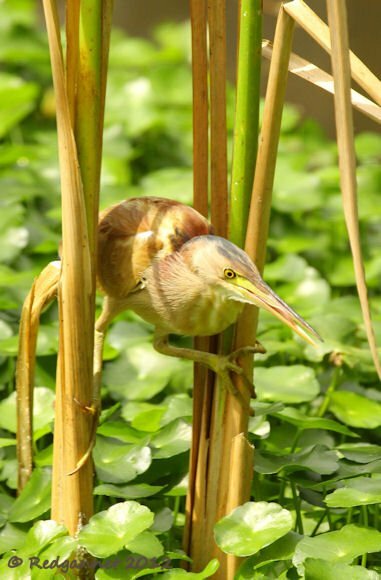 It will take insects and dragonflies as well as fish and the individual at Sungei Buloh spent much of the afternoon stalking through the weeds picking out water insects as well as aerial ones. As far as I know bitterns draw the line at hard licquour, but Thomas MacDonagh (1878 – 1916) would have us believe that they may not be so rare if they would take a tot from time to time. Macdonagh’s toast is to the Great Bittern Botaurus stellaris, but for anyone who likes birds and a wee dram, it makes a good read. Where he lived alone like a hermit monk. For I fear I should die in the end of thirst. And drinks in the marsh from the lone bog-drain. Your soul would have stirred and waked anew. And will lengthen my road by many a mile. You’ll get no sup when your life is past. Till the summer is here and the sunny days. And a dram won’t stop our thirst this night. Love those pics. The one of him upside down is particularly great. Those are absolutely amazing photos! Wow! Most excellent pics. I’m envious of your mad phtographic skills. Beautiful images! I was very pleased to see this species on a visit to Thailand. Beautiful images of such a rare bird. It must have taken a lot of time to take these and my favourite is the one of it jumping into the water! There won’t be many photos of them doing that in the world. Cheating on Your Spouse? Blame the Weather!